Abfresh - Cleaning Services based in Birtley, County Durham. Serving Newcastle, Gateshead, Sunderland, Durham, and surrounding areas, with over 17 years of carpet cleaning expertise. 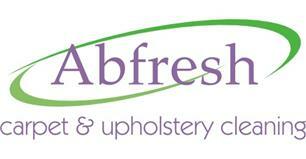 Abfresh provides carpet and upholstery cleaning to both public and private clients throughout the local area. Established in 2001, we are a family-run business that prides itself on customer service. The company provides individuals with a range of specialist cleaning and treatments, including leather. Using top of the range machines, ecologically friendly cleaning solutions and expert service the business is designed as a cost effective way of keeping your carpets and upholstery feeling and looking like new. We are a registered company, and for your peace of mind, are fully insured.